Size: 2911 sq.ft. - 3368 sq.ft. 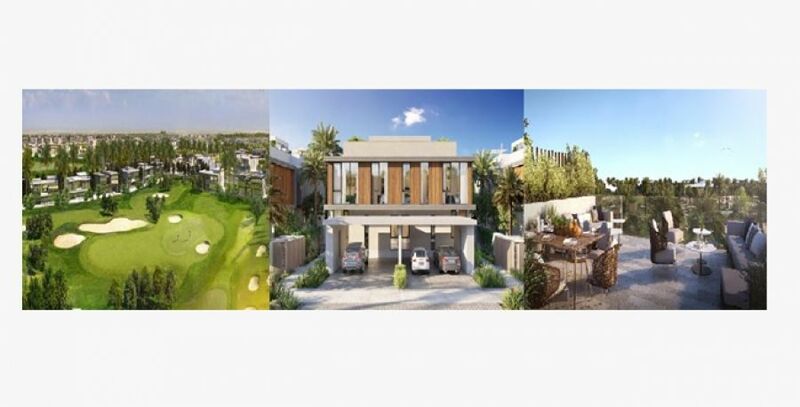 Golf Grove is a family oriented villa community launched in January 2019 by EMAAR Properties in the ideal location for living and investment at Dubai Hills Estate. In this project, EMAAR has accumulated all contemporary styled units from the starting rate of AED 3 Million for 3 Bed and AED 3.8 Million onwards for 4 Bed. Get lost into lush landscaping, manicured lawns enveloped into palm trees. Each villa has an expansive rooftop terrace where you can celebrate special occasions and entertainment things. This will be the final villa project to be developed in Dubai Hills Estate which is estimated to be handover by August 2021. Golf Grove Villas are being offered on a post-handover payment scheme. Golf Grove community is elegantly architect with villas of 3 BR and 4 BR within the surrounding of serene atmosphere and parks. It ranges from 2935 Sq.ft to 3360 Sq.ft, complemented by plenty of fresh greenery and natural light from the window. The residents can pick any from three architectural types – "Eames, Savoye and Aalto" that serve to every individual taste. Eames presents Modern villas with deep inset walls, glazing and shadow casting window screen. Savoye presents Contemporary villas with a finishing look. Aalto type offers 4 Bedroom units, the villas with an emphasis on clean lines, views of nature and material palette. Being within reach to everything it saves your time and keeps you closer to all the comforts and needs without commuting too far. Emaar Golf Grove Villas is a few steps away from 1.2 Million Square Meter of Golf Course. It is in a convenient location from Downtown Dubai, schools, hospitals, airports, metro station etc. Living in a meticulously designed mixed-use community represents an exclusive blooming lifestyle and assures you prestigious investment options. Dubai Hills Estate development will have new addition The Mall(under construction) which will be larger than the Mall of Emirates, three top schools, college, hospitals and child-friendly neighbourhood with wonderful places for kids. Golf Grove community offers you easy access to Dubai Miracle Garden, Jumeirah Village Circle, Al Barsha South, Dubai Autodrome connecting via Sheikh Mohammed Bin Zayed Road, Ras Al Khor Road, Dubai Al Bin Road and Al Khail Road. Emaar Golf Grove community is accessible from Umm Suqeim Road at Dubai Hill Estate located in Mohammed Bin Rashid City, Dubai, UAE. EMAAR Properties is a Dubai based real estate company active since 1997. They have redefined the Middle East skyline by bringing their residential, commercial, retail and hotel projects. EMAAR Properties homes are like a celebration of having an opportunity to buy a home within a city of meticulously master planned communities. EMAAR is the world's most admired and valuable realty company, also listed as a Public Joint Company. Has delivered about 36500+ villas and apartments in the Middle East and internationally they have contributed 693000 Sq.ft. The most famous creation of EMAAR is The Dubai Mall, Burj Khalifa, The Dubai Fountain and the residential projects are Dubai Marina, Emirates Living, Arabian Ranches, Dubai Hills Estate etc. Golf Grove Villas community is featured with all the day to day amenities like Private Parking, Clubhouse, Retail outlets, Children Play Area, Family Outlets, BBQ, Well Equipped Fitness Centres, Nursery, Public Park, Reel Cinema, Hypermarket, 24 Hours Security, Built in Wardrobes, Communal Gardens and many more. Schools - Oxford School, Indian Academy Dubai, Dubai International Academy & Green Hills Nursery. Shopping Malls - The Dubai Mall, Mall of the Emirates & Uptown Mall. Restaurants - Certo Italian Restaurant, Aioli Restaurant & Café, Taco Barrio & NAY Restaurant. Hospitals - Emirates Specialty Hospital, Al Garhoud Private Hospital & Dr. Riadh Hospital. Movie Theaters - Novo Cinema, Vox Cinemas & Reel Cinemas.